Herbert George Wells (September 21, 1866 – August 13, 1946), better known as H. G. Wells, was an English author of science fiction novels such as The Time Machine, The War of the Worlds, The Invisible Man, and The Island of Doctor Moreau. H.G. Wells is often considered to be remarkable for his ability to accurately forecast a number of technological and scientific developments, including the invention of the atomic bomb. Wells was a master prose stylist, and his novels are well-regarded not only because they provide insights into science and society, but also because they are easy and entertaining to read. Wells was a prolific writer of both fiction and non-fiction, producing works in many different genres, including contemporary novels, history, and social commentary. He was also an outspoken socialist. His later works become increasingly political and didactic, and only his early science fiction novels are widely read today. Wells, along with Hugo Gernsback and Jules Verne, is sometimes referred to as "The Father of Science Fiction," as it is almost impossible to imagine science fiction without Wells' contributions. 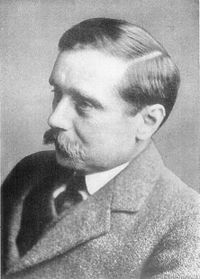 Herbert George Wells, was the fourth and last child of Joseph Wells and his wife, Sarah Neal. The family was of the impoverished lower-middle-class. An inheritance had allowed them to purchase a china shop, but the shop never provided much income. To make ends meet, Joseph sold cricket bats and balls and other equipment at matches in which he played, but this was an unsteady amount of money, since at that time there were no professional cricketers, and payment for skilled bowlers and batters came from voluntary donations after the match, or from small payments from the clubs where matches were played. No longer able to support themselves financially, the family instead sought to place their boys as apprentices to various professions. From 1881 to 1883 Wells had an unhappy apprenticeship as a draper at the Southsea Drapery Emporium. His experiences were later used as inspiration for his novels The Wheels of Chance and Kipps, which describe the life of a draper's apprentice and serve as a critique of the world's distribution of wealth. In 1883, Wells's employer dismissed him, claiming to be dissatisfied with him. The young man was reportedly not displeased with this ending to his apprenticeship. Later that year, he became an assistant teacher at Midhurst Grammar School, in West Sussex, until he won a scholarship to the Normal School of Science in London, studying biology under T. H. Huxley. As an alumnus, he later helped to set up the Royal College of Science Association, of which he became the first president in 1909. Wells studied in his new school until 1887 with an allowance of 21 shillings a week thanks to his scholarship. He soon entered the Debating Society of the school. These years mark the beginning of his interest in a possible reformation of society. At first approaching the subject through studying The Republic by Plato, he soon turned to contemporary ideas of socialism as expressed by the recently-formed Fabian Society dedicated to socialism, and free lectures delivered at Kelmscott House, the home of William Morris. He was also among the founders of The Science School Journal, a school magazine that allowed him to express his views on literature and society. The school year 1886-1887 was the last year of his studies. Having previously successfully passed his exams in both biology and physics, his lack of interest in geology resulted in his failure to pass and the loss of his scholarship. In 1891 Wells married his cousin Isabel Mary Wells, who divorced him when she discovered the nature of his affair with one of his students, Amy Catherine Robbins, whom he married in 1895. He had two sons by Amy: George Philip in 1901 and Frank Richard in 1903. Wells' first bestseller was Anticipations (1901). When originally serialized in a magazine it was subtitled, "An Experiment in Prophecy," and it is still considered his most explicitly futuristic work. Anticipating what the world would be like in the year 2000, the book is interesting both for its accurate predictions — trains and cars resulting in the dispersion of population; moral restrictions declining as men and women seek greater sexual liberation; the defeat of German militarism, and the existence of a European Union — as well as for its less-than-accurate musings. Wells called his early novels, "scientific romances," inventing a number of themes now classic in science fiction in such works as The Time Machine, The Invisible Man, and The War of the Worlds. He also wrote other, non-fantastic novels which have received critical acclaim, including the satire on Edwardian advertising Tono-Bungay and Kipps. Though Tono-Bungay was not a science-fiction novel, radioactive decay plays a small but consequential role in it. Radioactive decay plays a much larger role in The World Set Free (1914). This book contains what is surely Wells' most striking prophecy of the future of science: Scientists of the Wells' day were well aware that the natural decay of radium releases energy at a slow rate over thousands of years. Although the rate of release is too slow to have practical utility, the total amount of energy released by the decay of radium is huge. The World Set Free revolves around an unspecified invention that accelerates the process of radioactive decay, producing bombs that explode with no more than the force of ordinary high explosive— but which "continue to explode" for days on end. "Nothing could have been more obvious to the people of the earlier twentieth century," he wrote, "than the rapidity with which war was becoming impossible… [but] they did not see it until the atomic bombs burst in their fumbling hands." Leó Szilárd acknowledged that the book inspired him to theorize the nuclear chain reaction — leading directly to the invention of the atomic bomb. Wells also wrote nonfiction. His bestselling two-volume work, The Outline of History (1920), began a new era of popularized world history. It received a mixed critical response from professional historians, but was praised by Arnold J. Toynbee as the best introductory history available. Many other authors followed with 'Outlines' of their own in other subjects. Wells reprised his Outline in 1922 with a much shorter popular work, A Short History of the World, and two long efforts, The Science of Life (1930) and The Work, Wealth and Happiness of Mankind (1931). Wells called his political views socialist, but he occasionally found himself at odds with other socialists. He was for a time a member of the left-of-center Fabian Society associated with the Labour Party, but who "broke with the Fabians in 1909 on the issue of mass agitation (or rather lack of it). "He broke with them because they were not sufficiently radical enough for his tastes. He became a staunch critic of their grasp of economics and educational reform. He also ran as a Labour Party candidate for London University in 1922 and 1923, but even at that point his faith in that party was flagging. ↑ Geoffrey Doyle Review of Outline of History. Clemson College.Retrieved March 16, 2008. ↑ Contents of A Short History of the World .www.bartleby. Retrieved March 16, 2008. ↑ The History of Economic Thought.Retrieved March 16, 2008. Wells, H.G. An Experiment in Autobiography. Macmillan Co. 1934. ASIN: B000GP0SWE556. "C. S. Lewis, H. G. Wells and the Evolutionary Myth", by Michael W. Perry, 1998. "H. G. Wells and the Genesis of Future Studies", by W. Warren Wagar, 1983. "Wells, Hitler and the World State", by George Orwell. First published: Horizon.—GB, London.—August 1941. "Wells' Autobiography", by John Hart, from New International, Vol.2 No.2, March 1935, pp.75-76. History of "H. G. Wells"
This page was last modified on 22 July 2017, at 23:06.